JA Is a Thought Leader in the Industry! Take a look at thought leadership content we've developed. What do you want to be when you grow up? It's an question we have all been asked, but selecting a career is a decision many teens and young adults tend to put off, as discovered in this research. "Disconnected Youth" are defined as those between the ages of 16 and 24 who are not employed nor enrolled in school. This research, conducted by the Population Reference Bureau for Junior Achievement USA, explores how those characteristics have changed since 1970 and touches upon implications for future policies and programs. Technology in the classroom is changing the way students learn and teachers teach. 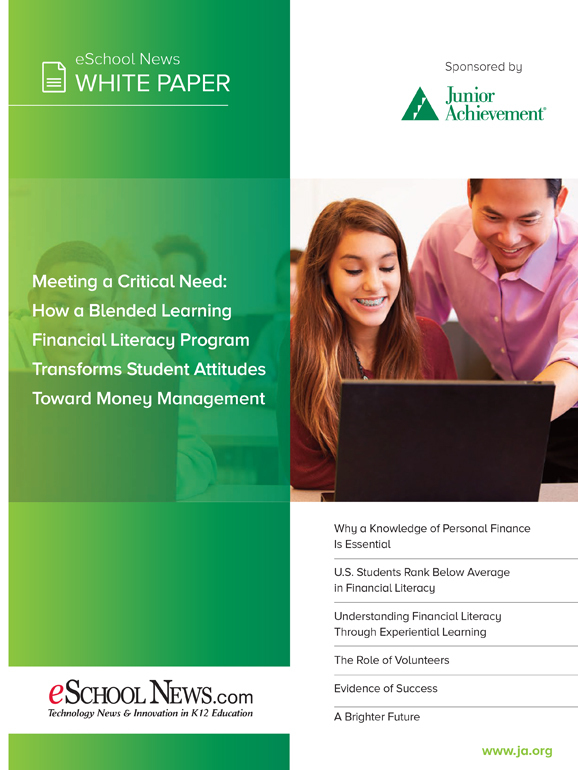 This white paper, done in conjunction with eSchoolNews, explores how blended learning is impacting young people's attitudes and behavior related to money management. Read More. Teens may think they are ready for college, but are they prepared to pay for higher education? 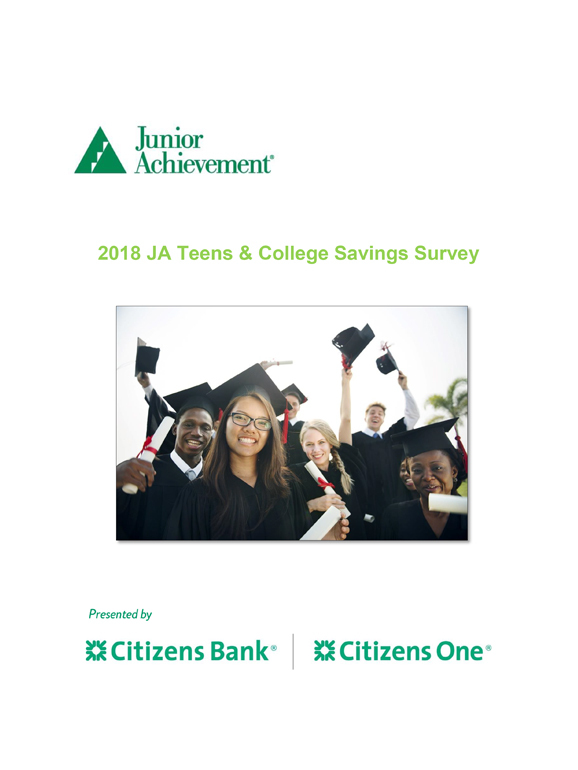 This JA Teens and College Savings survey explores how ready today's young people are to make one of the biggest investments of their lifetime. Read More. Today's 18-year-olds could start contributing to a 401K or Roth IRA with their first job, but many won't. This survey explores teens' knowledge and attitudes when it comes to saving for retirement. Read More. This survey of teens finds that only half of them plan to seek financial independence from their parents as adults! This, and other important insights, are available in this JA Teens and Personal Finance executive summary. Read More. 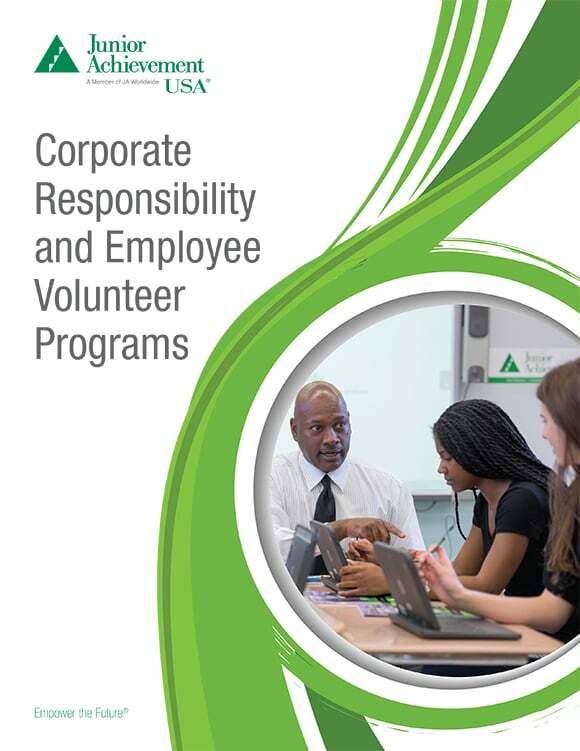 Employee Volunteer Programs (EVPs) are an essential part of many Corporate Responsibility initiatives. But how can CR professionals ensure that their EVP efforts are meeting the needs of employees while advancing the goals of the company? This research by Junior Achievement and the Corporate Responsibility Association addresses these and other questions. Read More. In its first survey of elementary-aged children and their parents, Junior Achievement discovers how well kids understand money while learning when parents think children should start learning about financial concepts. This research is presented in conjunction with the Jackson Charitable Foundation. Read More. Everyone agrees that STEM plays an important role in the job market of today…and tomorrow. But what do teens think of STEM, and other career fields, and how does that perspective differ by gender? The 2017 Teens & Careers Survey by Junior Achievement and EY explores those issues, and more. Junior Achievement's 2016 Teens and Personal Finance Survey, sponsored by the Voya Foundation, shows that teens believe borrowers, not the government, are responsible for paying off their student loans. The number of states offering entrepreneurship education programs more than doubled between 2009 to 2015. See if your state is one of them. Junior Achievement's 2015 Teens and Personal Finance Survey, sponsored by The Allstate Foundation, reveals a surprising disconnect between teens' and parents' views around paying for college and managing money. Junior Achievement, with the help of partners like Citi, is scaling volunteer engagement using technology and a blended learning approach. See what students and teachers have to say about this new model that supports the JA Education Gateway. The rising cost of college is spurring many young adults to re-evaluate their post-secondary education options. See what Millennials are saying about it. Are Students Prepared for the Workplace? Business leaders claim that the generation of students entering the workplace lacks many critical "soft" skills like problem solving and critical thinking, abilities that contribute to an individual's and an organization's success. Explore Junior Achievement's new proposed model that links a foundation of recognized knowledge, skills and attitudes to measurable engagement and achievement activities. The application of this model can potentially lead to a student who is credentialed to be "workforce ready," fully prepared to contribute meaningfully upon entering a 21st century global workplace. 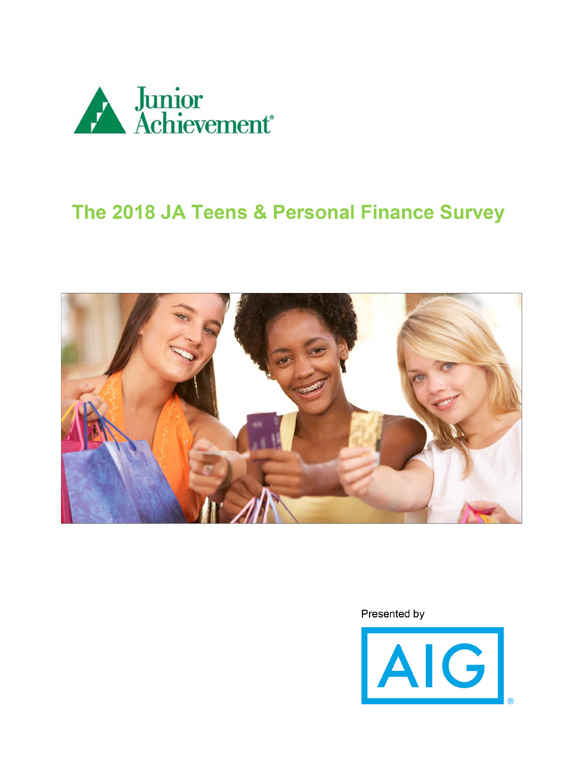 Junior Achievement's 15th Teens and Personal Finance Survey examines teens' and tweens' attitudes and behaviors around managing money. Data collected from young people ages 8-13 are included for the first time in this year's survey. See what Millennials are saying about becoming entrepreneurs, and how mentoring can play an important role in start-up business growth. Millennials have very different ideas than other generations about volunteerism and their preferred ways of supporting their favorite causes. How do Millennials manage their money? Are they more frugal or more extravagant than other age groups? See what the data say. It's no surprise that Millennials interact with technology very differently than other generations. Get the scoop here. Today's teens want to pursue careers that will provide both financial rewards and job satisfaction. To gauge teens' perspectives on their ideal careers and what steps they will need to take to get on their desired career path, Junior Achievement USA and the ING Foundation recently conducted their 12th annual Teens & Careers Survey. America's schools face unprecedented challenges to prepare students for postsecondary education and entry into the U.S. and global workforce. Discover how programs developed by JA USA directly support the goals of the Common Core State Standards Initiative at elementary, middle, and high school levels to ensure students are college and career ready. The workforce skills gap has a significant impact on our nation's productivity, economy, and global competitiveness. Learn more about this issue and how Junior Achievement is addressing it, by teaching students how to apply the knowledge they learn in the classroom to real-world problems and equipping them with the skills they need to be college- and career-ready. What Do Teens Say about Money Management? Read what teens are saying about how they manage money and when they want to learn these important skills. There is ample evidence that volunteering can strengthen work teams and build employee skills as well as contribute to professional development. Check out the impact report results for more information! JA/ING Poll on kids and careers finds that a majority of teens are confident they will find their ideal career. Junior Achievement reached out to its alumni to help determine the long-term impact of JA programs. Our alumni are more than twice as confident that they can successfully compete in a business environment, compared to adults without JA experience. Check out the impact report results for more information!